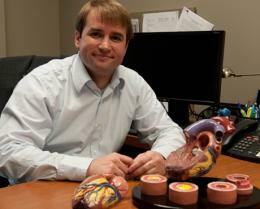 New ability to regrow blood vessels holds promise for treatment of heart disease. (Medical Xpress) -- University of Texas at Austin researchers have demonstrated a new and more effective method for regrowing blood vessels in the heart and limbs — a research advancement that could have major implications for how we treat heart disease, the leading cause of death in the Western world. The treatment method developed by Cockrell School of Engineering Assistant Professor Aaron Baker could allow doctors to bypass surgery and instead repair damaged blood vessels simply by injecting a lipid-incased substance into a patient. Once inside the body, the substance stimulates cell growth and spurs the growth of new blood vessels from pre-existing ones. The method has been tested successfully on rats, and findings of the study were published recently in the Proceedings of the National Academy of Sciences. The article goes on to describe how this treatment may be applicable to people suffering from chronic myocardial ischemia, which affects around 27 million people in the US alone. A simple noninvasive treatment such as this could mean less pain and improved quality of life for many, and could literally be the difference between life and death for many others.